There are many different types of restaurants and they can be classified by the type of cuisine they serve, such as Mexican or Italian, the menu style, such as a la carte or blackboard, and the pricing. They can also be classified by how the food is served to the customer. A waitress stands in front of outdoor tables. Full-service restaurants are where diners are seated at tables and are waited on. Their orders are taken while they are at the table, and the food and drink is delivered to the table. Full-service encompasses fine dining, silver service and casual dining geared toward families. In some cases, food is cooked at the table, but in all cases there is no requirement for guests to leave the table once they have arrived. A waiter serves a dessert to a woman at a table. Counter service requires diners to walk up to a service counter to place their order. Often the menu is displayed on a blackboard. Diners' food is brought to their table when ready, or they are given a ticket number which is called out or displayed electronically when the food is ready, then collected by the diner from the counter. Payment is normally made at the service counter before the food is ready. A woman places her order at the counter. A variety of food is displayed and guests either take a plate and serve themselves from the buffet then return to eat at a table, or waiters behind the buffet serve items such as meat which they carve as you select it. Buffets are usually a set price, which is paid before you get your plate. It is basically a self-serve kind of food service. 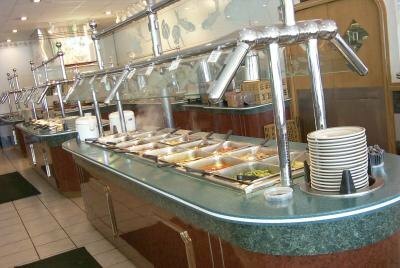 A buffet in a restaurant is ready for patrons. Quick service is where there is a service counter with one or more cashiers working to take orders. They are known as fast-food or convenience outlets. Customers normally order from a menu that is displayed behind the counter or on a wall. Quick service restaurants often have a drive-thru so you can order from a car. There are a limited number of menu items constantly being prepared. McDonalds is an example of a quick service restaurant. 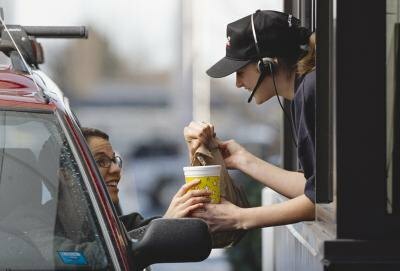 A fast-food employee hands a customer her order from a drive-thru window.